Preheat oven to 375 degrees Fahrenheit. Place the two sliced sub rolls on a two pieces of aluminum foil. Set aside. In a large skillet, saute onions and green peppers for about 3-4 minutes, then add in the mushrooms, and cook until softened, about 3 minutes. Place in a bowl and set aside. In the same skillet, cook the steak, breaking it into smaller pieces, until all is cooked through, about 5 minutes. Add the onions and peppers back into the skillet and toss together (seasoning with salt and pepper, to taste). To assemble the cheesesteaks: open one sub roll and add in half of the meat filling then top with half the provolone cheese. Repeat for the second sub roll. 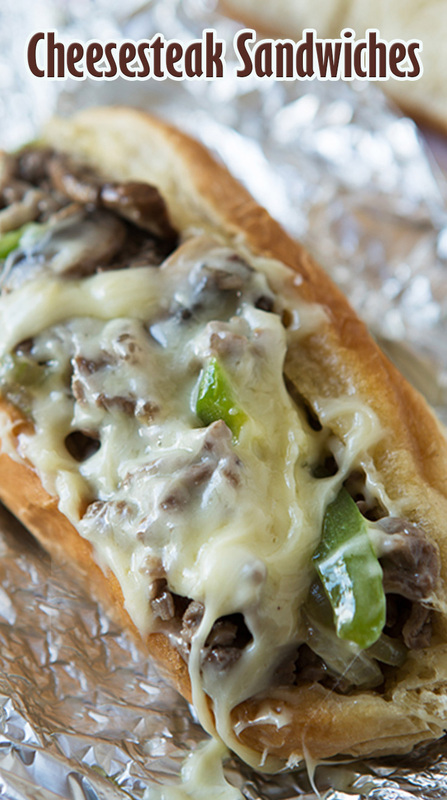 After 15 minutes, remove from oven and your cheesesteak sandwich is ready for you to unwrap (carefully, it'll be hot) and enjoy!